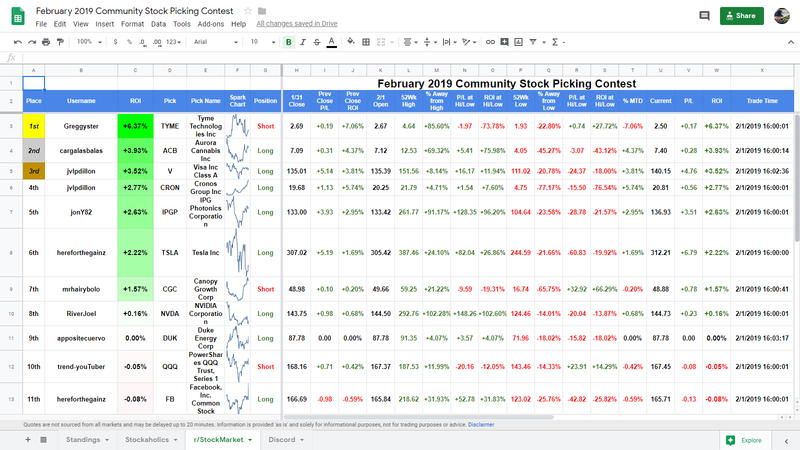 just in case some people fail to see this thread and don't submit their picks via the google form like in post #1, i'll just copy over members picks from our regular feb. monthly picks thread to here. but of course would prefer if everyone would use the google form to make my job a little easier haha. boom! just hit 10 members on the r/stockmarket reddit community. still needing 2 more on the discord community. but it's looking pretty promising thus far. we'll see how this looks by tomorrow's open. hoping we'll get 10 here on the stockaholics side as well. Just giving this a quick bump in case anyone has missed seeing this thread! Looking over the spreadsheet, there's some interesting picks in the different communities. 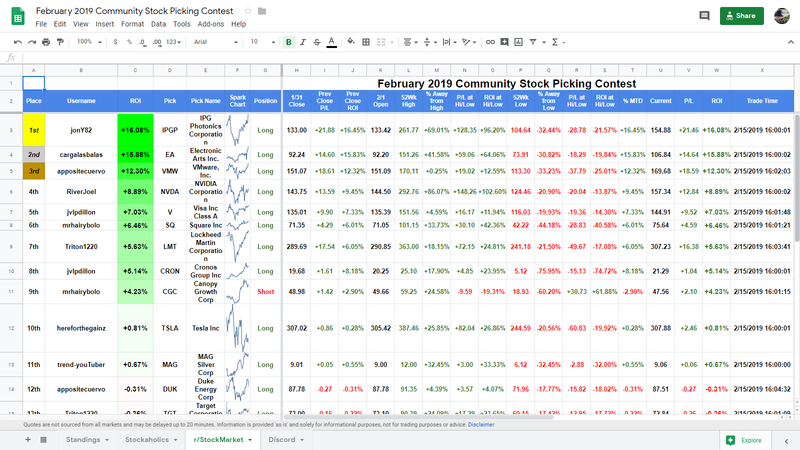 Darn, it looks like at least 5 participants did not submit picks via the Google Form for Stockaholics, and even if I copy over members picks from the regular monthly picking thread, we still fall short by 1 participant. 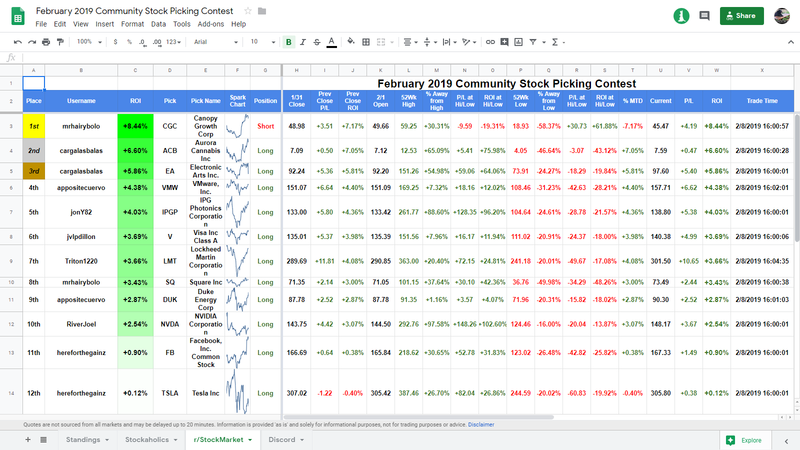 What ima do here is just copy over @Ken34's weekly picks from this week over to this community comp, unless someone can post 2 picks in here before today's market open, then I would just add those in instead. 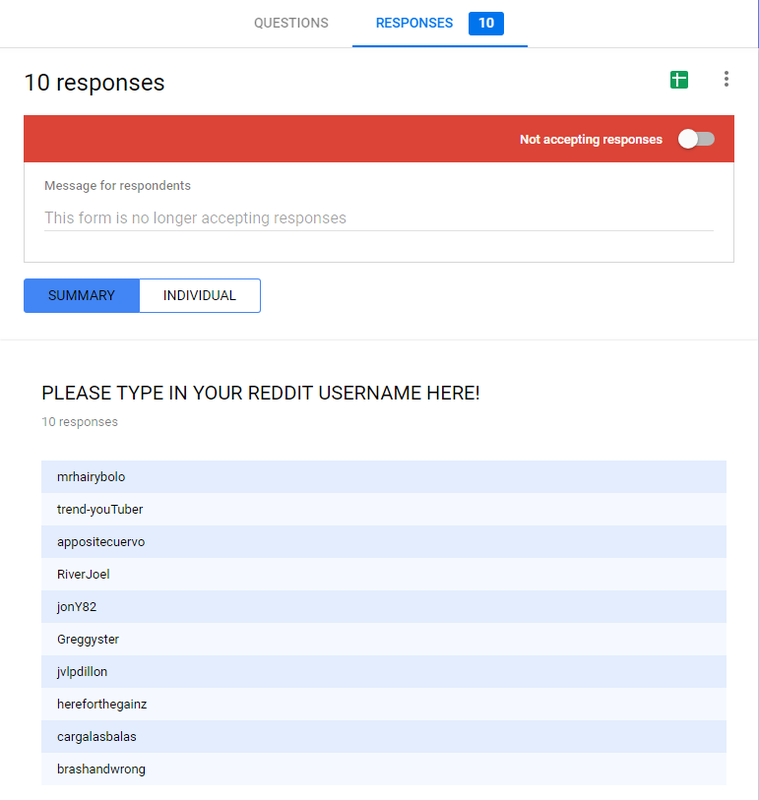 I'd hate to have to cut the participation down to 9 for our other communities since we did actually manage to get to the 10 members on our other 2 communities. BTW, it looks like unfortunately there were seeing some duplicate picks (at least 1 for each the r/StockMarket and the Discord community) dang it! 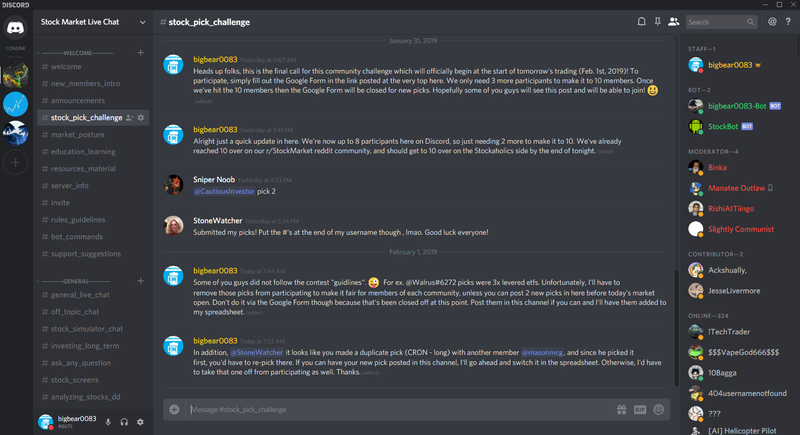 I was hoping this first ever run of this communtiy challenge would go off smoothly lol. Not sure what to do about that... Do I just let those picks stand? Like for example, 2 members picked TSLA - Long on the r/StockMarket community, while 2 members picked CRON - Long on the Discord community. And, since these picks were submitted via Google Form, it's actually a little difficult to ask members to change their picks. Probably too late anyway as well. Worst case is I just let those picks stand. Would hate to have to take 'em out. I'll have to manage this a little better if I attempt to run this again in the future. ^^ To make matters worse, it looks like some people did not read the contest rules over on the Discord community, as I see some people picked 3x levered etfs. Decisions, decisions ... what to do about this. Do I still just let this all of this stand given that this is our first ever trial run of the community challenge? And, it's most likely too late to ask people to change picks at this time. I just posted this in the Discord server. We'll see if these guys can change their picks before today's open. Otherwise, I think I'll just remove the picks from the spreadsheet. That seems to be the most easiest and fair thing to do to be honest. 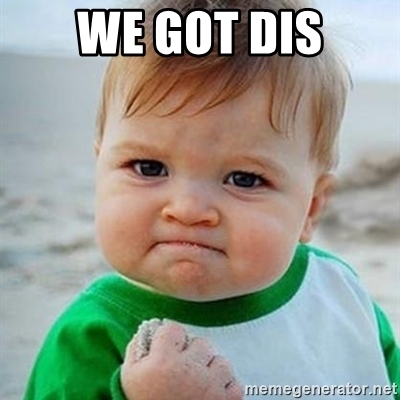 Also, I did get more than 10 members posting picks over on the r/StockMarket community. I am strongly mulling over removing the member who made the duplicate pick (TSLA - long) with another member, so that there isn't 2 picks of the same in their team spreadsheet. So just a quick heads up here. 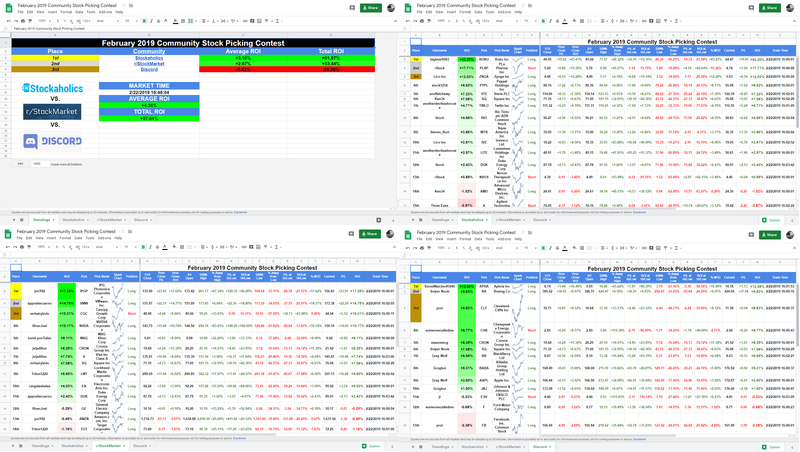 I went ahead and replaced one of the members on the r/StockMarket community who duplicated a members pick (tsla - long) and put in an another members picks in place of him. So, we're all good on the r/StockMarket side of things. Over on the Discord community, I managed to get one member to switch a pick that was being duplicated (cron - long) and he switched it up with cgc - long. So, we're good there. However, as you will notice when you view the spreadsheet, the 3x picks are still up. I think am going to take those 2 picks off the Discord community sheet, but first I think I'll mull it over this weekend and see what the ultimate outcome will be. For now, I'm keeping them on. Anyway, here's a quick view of the main leaderboard sheet. The r/StockMarket community off to the early lead. BTW fellas, the link for the spreadsheet is on the first post of this thread in case y'all were looking around for it. Aside from those 3x picks, it's looking pretty good so far. After Day/Week #1 it's the r/StockMarket community with the early lead in this monthly community challenge thus far! After Week #2 it is still the r/StockMarket community holding onto the lead thus far! After Week #3 the r/StockMarket community still holding onto the lead thus far with just 2 weeks left to play! <-- click there to view the full contest spreadsheet! After Week #4 the Stockaholics community has taken the lead with just one week left to play! C'mon Stockaholics we got this! I just barely missed getting in on those Options last week. whelp, today is the final trading day for the community challenge.